Successfully Added MeeGoPad T01 Microsoft Windows 8.1 OS TV Stick - Quad-Core CPU, 2GB RAM, 32GB Internal Memory, HDMI Interface (White) to your Shopping Cart. The MeeGoPad T01 Microsoft Windows 8.1 OS TV Stick boasts a Quad-Core CPU, 2GB RAM, 32GB Internal Memory, Bluetooth and has an HDMI Interface. The MeeGoPad T01 is here to revolutionize the TV stick and TV dongle market. Typically these devices run on an Android OS but the MeeGoPad T01 comes with a Windows 8.1 operating system. This much anticipated TV dongle is here to answer the prayers of all those who have been longing for a small portable Windows 8.1 PC that can fit in their pocket. Simply plug this PC stick into the HDMI port of your TV or monitor, connect a power supply, and hay presto, you have a fully functioning Windows PC. With a Quad Core Intel Bay Trail-T (4C/4T) SoC 2W CPU and 2GB of RAM you get a great performance. What’s more the unique Intel Burst Technology allows this multi-core processor to power down unused cores so it can dedicate all resources to boost the performance when running single thread tasks making it faster and more efficient than other TV sticks and PC dongles. This MeeGoPad arrives with 32GB of built-in storage space that can be expanded by means of the micro SD card slot for an extra storage space. You can connect to the many ports that are available on this TV stick, which includes one micro and one regular USB 2.0 port making it ideal for connecting your mouse or a keyboard. 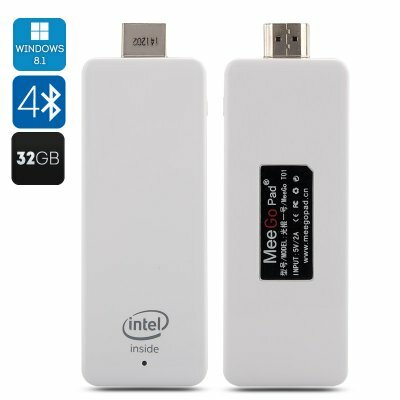 Log on to the World Wide Web via Wi-Fi as this Windows TV dongle supports 802.11b/g/n so you can view your favorite websites. Plus you can sync or pair to other devices using Bluetooth 4.0. Redefine the PC by bringing Windows into your front room. This product is in stock now, we guarantee next working day shipping and offer a 12 months warranty on all our products. Brought to you by the leader in electronic devices and wholesale TV Sticks, Chinavasion. Please ensure that the HDMI and power adapter are connected correctly before powering on to prevent any harmful risk to the product or the Windows system. This product comes with a trial version of Windows. On Chinavasion, the description sounds like this is a superfast PC with Windows 8.1 and high definition graphics that's just as good as a big PC. In fact it's SO much better. Took me less than 10 minutes to set up out the box before I saw the first Windows screen on my TV, then it updated, rebooted and then it was ready for action. I matched it with a mini keyboard with touchpad and that was just perfect. Definitely the best gadget I've bought in many years. The only bad point is that it wasn't around a year ago when I spent a lot of money on a home theatre PC to connect to my TV - this stick does the same job but much better.